Provides up to 10 dBi of gain on all 2G, 3G and 4G/LTE/xLTE/AWS frequency bands (700~2700 MHz) used by US, Canadian and Mexican cellular carriers such as Verizon, AT&T, T‑Mobile, Rogers, Bell Mobility, Telus, Telcel and most other cellular operators. With the appropriate adapter cable (not included), this antenna is compatible with cellular modems, Mi-Fi Hotspots, routers and signal amplifiers from companies such as CalAmp, Cisco, Cradlepoint, Digi, MoFi, Netgear, Novatel, Pepwave, Proxicast, Sierra Wireless, SureCall, weBoost/Wilson and ZTE. This antenna is also suitable for unlicensed 900 MHz (ISM) radio applications and 2.4 GHz WiFi / ISM band use. 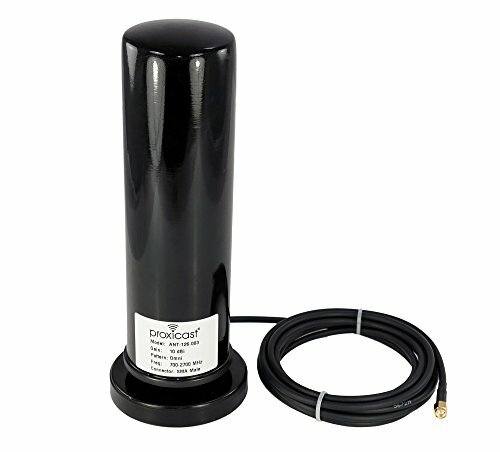 Includes the high-gain omni-directional antenna, an extra large premium 3.6 inch magnetic NMO mount antenna base with protective rubber cap and 10 ft of low-loss coax cable with an SMA male antenna connector. This antenna is a smart choice for mobile or stationary applications where extra gain is required. The omni-directional design and long coax cable allow optimal positioning for maximum signal reception and provide high gain without the cellular tower location and antenna alignment hassles of directional Yagi, sector and panel antennas. Note: LTE MIMO devices should use 2 identical antennas separated by at least 22 inches for best results.